This image has haunted me ever since Lovett Weems shared it with a group of cabinet members gathered from around the South East Jurisdiction in January. During most of our lives, the annual U.S. death rate per 1,000 has been well under 9 persons. During 2002 it began to escalate to just below 9 and has plateaued there until now. And it will continue there until about 2018 when it will escalate in what looks like a death tsunami. If many of our congregations continue on their current course, the effects as this tsunami washing over them will be devastating. Dr. Weems shares two recommendations for congregations, conferences and the general church hoping to ride out this death wave. 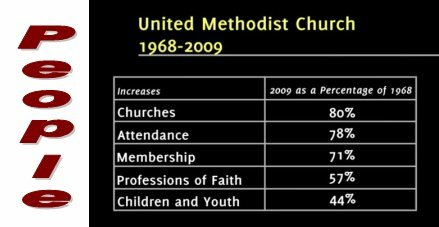 First, the current course of UM congregations as a whole since 1968 when the Methodist Church and United Brethren Churches merged: We have done well with money and not so well with people. And how did we do this? Each year for 30 years fewer people kept giving more money . . . until 2009; then the giving and expenditures actually declined by 60 million dollars. Why can’t we expect the recovering economy simply to pull us out of this slump? Because of the coming death tsunami. The death rate in the UMC is 35% higher now than in 1968. There will be more deaths and a higher death rate in 2050 than at any time in US history since the introduction of antibiotics. There will be twice as many deaths in 2050 as in 2010. And the majority of deaths will be within the exact demographic makeup of the United Methodist Church. The first challenge is to reset the financial baseline. While congregations and conferences can continue for the next 8 years about as they have – each year asking less people to give more money – this strategy can’t work long-term. 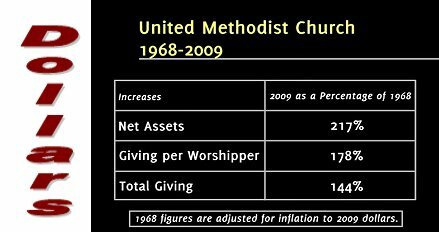 Indeed as the average age of United Methodists now climbs well above 60 years of age, more and more declining congregations are going to find themselves teetering at the tipping point where the loss of just a few more generous givers is going to make the difference between financial solvency and financial crisis. And those congregations focused on financial survival cannot focus effectively on missional effectiveness. In other words, those congregations that are going to weather the death tsunami are going to have to learn to reset their ministry financially, stepping back to less staff and less expenditures. 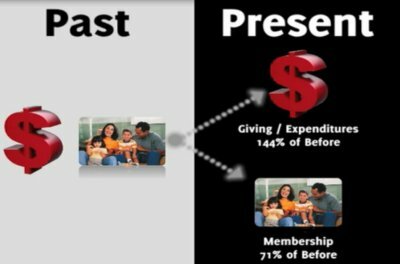 Sustaining current levels of financial giving will enable congregations to survive in the short term, but not in the long term, beginning in 2018, when the death tsunami strikes. The second challenge is to focus on reaching more people, younger people and a more diverse people. The purpose of resetting our financial baseline is to free our preoccupation from financial survival to “making disciples of Jesus Christ for the transformation of the world.” Can’t we do both at the same time? No! We have already demonstrated that we can’t do both. But those congregations who reset financially and then establish some momentum reaching more people, younger people and a more diverse people before 2018 will be able to weather the death storm that is coming. 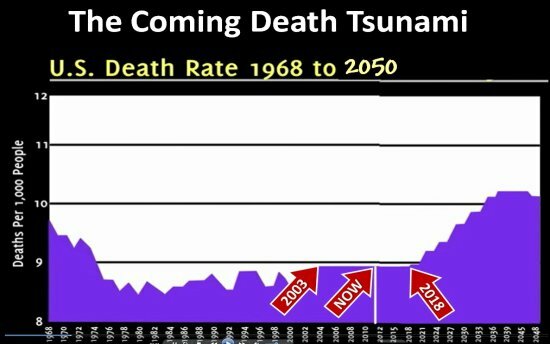 So how would you say your congregation is doing in preparing for the death tsunami? To hear Lovett Weems give the same talk I heard, go to http://www.vimeo.com/22392014 .